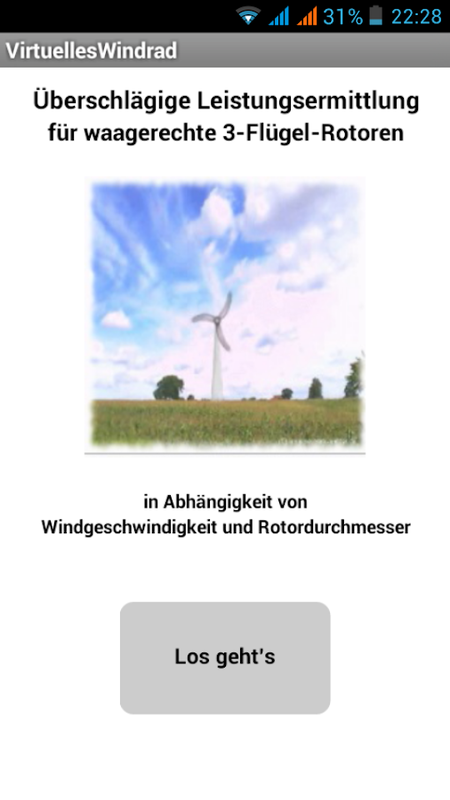 Virtual wind turbine provides fast,approximatedetermination of performance of wind turbines. 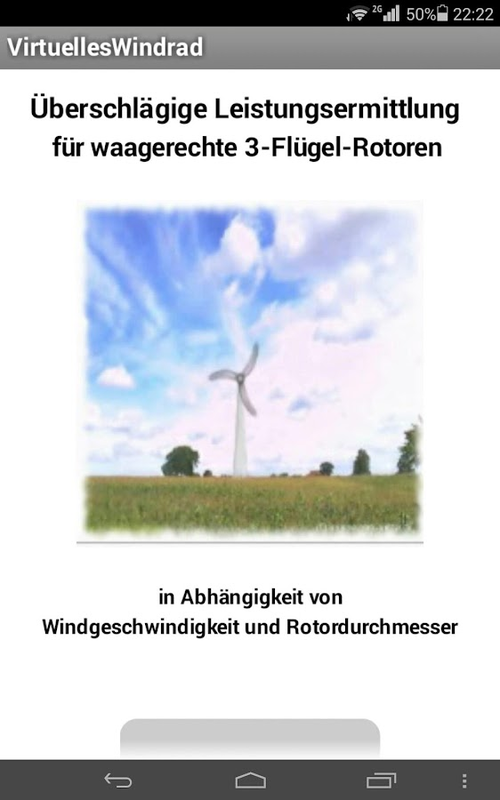 The calculation applies for wind turbines ( wind generators)with a rotor on a horizontal axis and 3 blades. 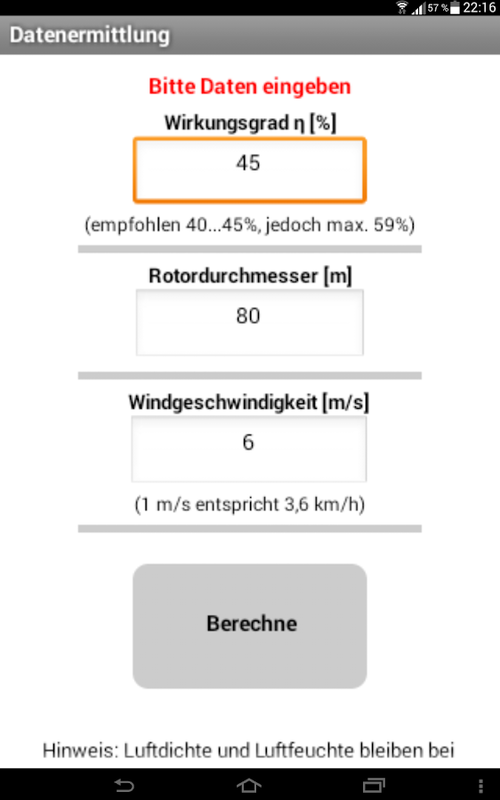 Only the diameter of the rotor and the wind speed are requiredasinput parameters. The simulated efficiency may, but not needbechanged. This assumed efficiency of η = 45% you should use in the senseofrealistic results, at least not significantly change. Please feel free to send suggestions for improvements.E-mail:[email protected]. 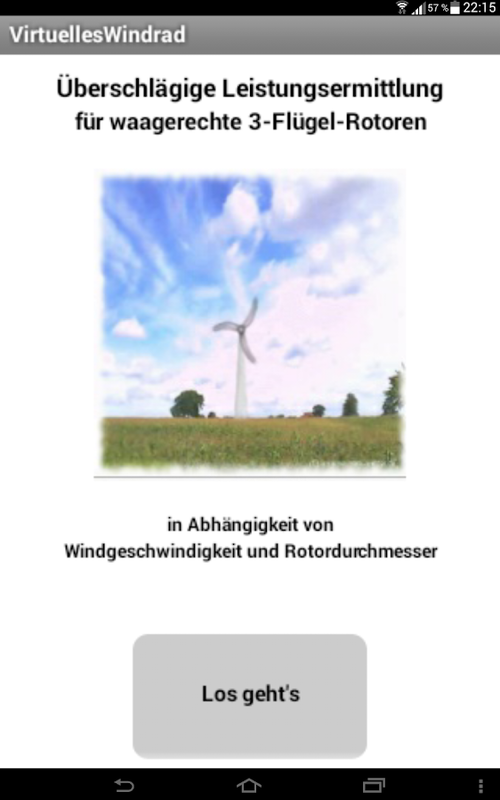 Der Benutzer des Energy Monitors ist in der Lage nahezu in Echtzeitwichtige Parameter von Windkraftanlagen und Windparks von einerVielzahl von Herstellern (Enercon, Vestas, Siemens usw.) 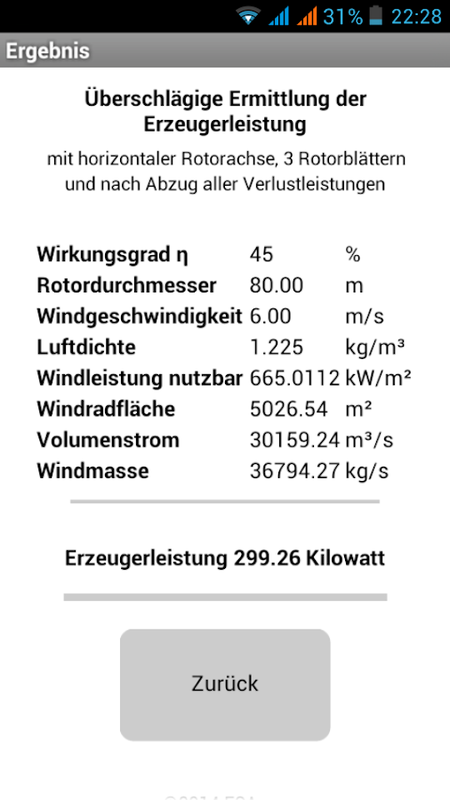 zukontrollieren.Sie überwachen:- Windparameter (Richtung,Geschwindigkeit)- Drehzahl- aktuelle Leistung in kW- Erträge-Verfügbarkeit- aktuelle und historische StatusdatenSie als Anwenderdes Energy Monitors sind damit immer und überall über den Statusihrer Windkraftanlagen informiert und können schnell und effektivauf eventuelle Störungen reagieren. 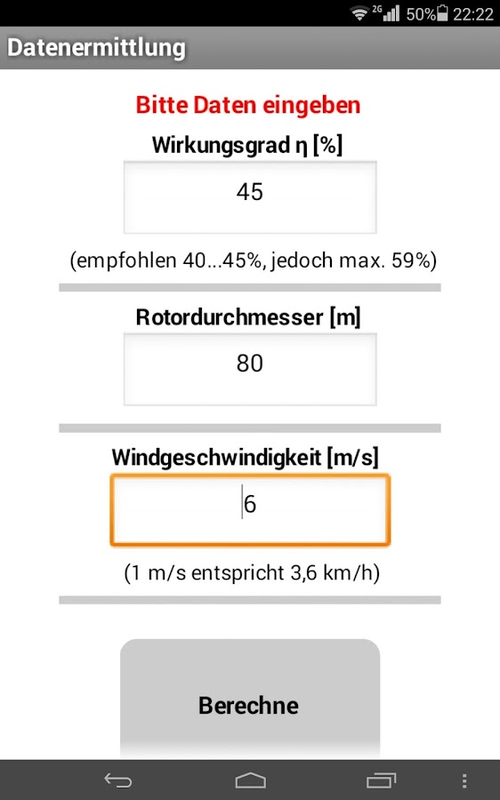 Mit einem Klick sind Sie mitdem zuständigen Service ihrer Windkraftanlage verbunden.Dieintegrierte standortselektive Windprognose lässt Sie anstehendeWartungen und Abschaltungen ertragstechnisch sinnvollerplanen.Sprechen Sie uns an, um einen kostenlosen Testzugang zuerhalten.The user of the Energy Monitor is able to monitor in nearreal-time are important parameters of wind turbines and wind farmsfrom a variety of manufacturers (Enercon, Vestas, Siemens,etc. 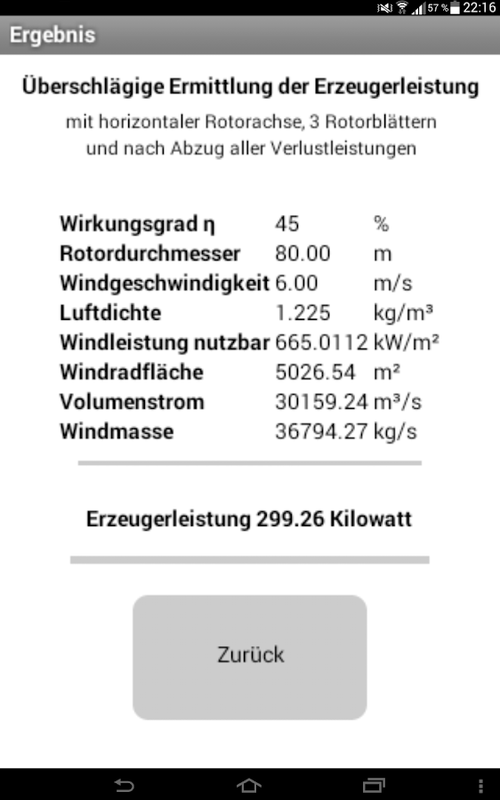 ).They monitor:- Wind parameters (direction, speed)- Speed-Actual power in kW- Income- Availability- Current and historicalstatus dataYou as a user of the Energy Monitor are therefore alwaysand everywhere informed about the status of their wind turbines andcan respond quickly and effectively to any faults. 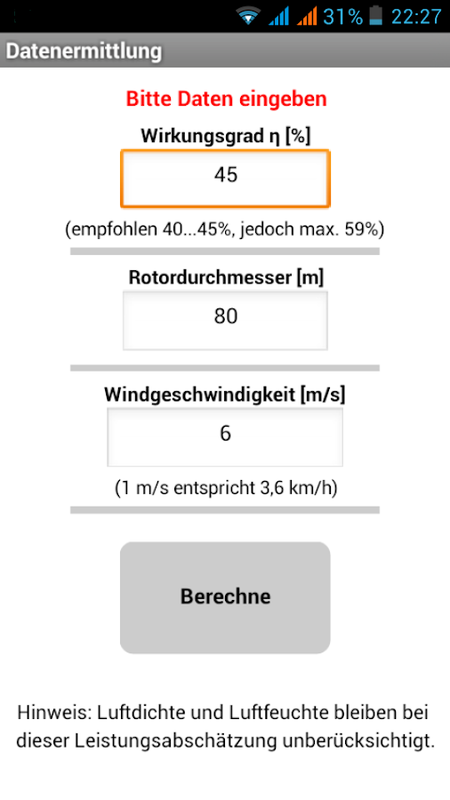 With one clickyou are connected to the competent service of their windturbine.The integrated site-selective wind forecast lets upcomingmaintenance and shutdowns plan profitable technicallymeaningful.Please contact us to receive a free trial.